Gabriele Marewski is an Innovative Farmer. In addition to dinners, Sunday morning brunches and occasional farm tours, Paradise Farms has branched out to other ventures, and recently started offering a venue for “sustainable, organic weddings” on the farm. Several cabins are available for B&B overnight stays. The farm is also venturing into the realm of value-added foods. “We have a large 3’x3’ 24 shelf dehydrator where we are making teas from our edible flowers,” Gabriele said. In addition,”We have received a Value Added Producer Grant from the USDA to dehydrate our oyster mushrooms into a delicious healthy snack for school vending machines.” (The mushroom snacks are still in the focus group tasting stage.) And of course, Gabriele has made a name for herself growing microgreens and edible flowers for high-end restaurants. 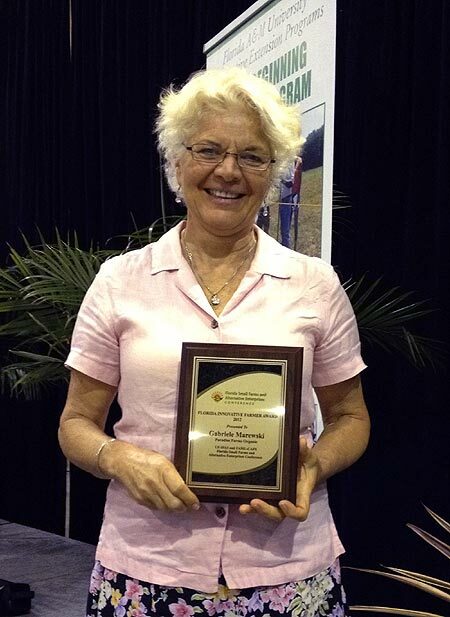 The Innovative Farmer Award is a joint venture by the University of Florida and Florida A&M University to assist the state’s small farms, which are defined as having sales of less than $250,00 a year, and represent more than 90 per cent of all farms in Florida. Great news. Love the Redland Rambles updates with dedication to reporting, photography and sharing the passion.